Fresh pineapple is a delight and a totally different experience from any form of preserved pineapple. Here in Brazil fresh pineapples are often available at a very good price, but when I lived in Canada high prices restricted my purchases of fresh pineapple to the category of "sweet indulgences." Often a single pineapple would cost 3 or 4 dollars, so I didn't pick one up every day in the supermarket. In addition to the price of the fruit, I begrudged the fact that a goodly portion of it would be thrown away in the preparation - the crown of course, but also the skin. Due to the formation of the fruit, with its spiny eyes in the skin, large amounts of delicious pulp would be lost when peeling away the skin. I often wondered if there was any possible use for the skin. Recently, here in Brazil, I came across a recipe for an iced tea made with pineapple peelings and lemongrass that's refreshing, delicious, healthy AND a great way to avoid having to compost or throw out the skin of a fresh pineapple. 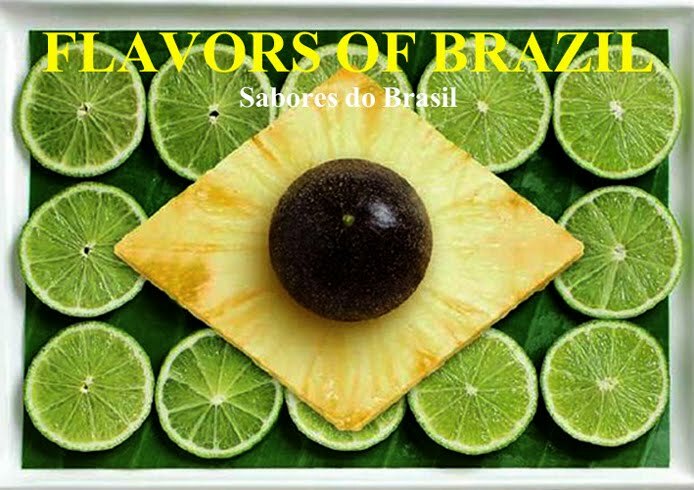 It was developed by Graziela Calfat and Ivana Cunha Morettin at Boa Bistrô in São Paulo, and I discovered the recipe on the site of Folha de S. Paulo, one of that city's major newspapers. Although lemongrass is a plant that comes originally from Southeast Asia, it grows well in Brazil where it's known under the names of capim-santo and capim-limão. It is generally consumed in teas and health drinks and hasn't become the flavoring ingredient that it is in Asia. It's considered more medicinal than culinary, but Brazilians consider it to be chock-full of health-bestowing properties. Next time you buy a pineapple at the market, remember to buy some lemongrass too, and when you prepare the pineapple, save the peels and make this tea. I guarantee you'll like it. Trim the lemon grass stalks, removing the woody outer layers, retaining only the tender cores. Crush them with the side of a cleaver, or chop finely. Place in a teapot, in a strainer or loose in the pot. Bring 1 pint water to the boil, pour over the lemongrass and let steep for 5 minutes. Strain if necessary, then reserve. Coarsely chop the pineapple peelings, Place them in a heavy saucepan, pour the lemongrass tea over and bring to a boil. Reduce heat and simmer for 15 minutes. Let cool and reserve. Using a blender or food processor, blend the pineapple peeling/lemongrass tea mixture until thoroughly blended. Taste for sweetness, then add honey if desired and blend again for a minute or so. Strain the mixture through a fine sieve into a serving pitcher. Refrigerate the tea, and when cold, serve in tall glasses over ice. I used the trimmings of a full pineapple and trimmings of 1-2 stalks lemongrass (not the meat)-bring to boil, then simmer for 30 minutes. Add a lime, and brown or white sugar or honey for sweetener. Since you are boiling the stuff, there is no need to wash. Run the tea through a screen. serve hot or cold Thanks for the recipe! You need to wash unless you want to boil pesticides and pollution accumulated on the leaf in your tea! !